The March 1956 demonstrations (also known as the 1956 Tbilisi riots or 9 March massacre) in the Georgian SSR were a series of protests against Nikita Khrushchev's de-Stalinization policy, which shocked Georgian supporters of Marxist–Leninist ideology. The center of the protests was the republic's capital, Tbilisi, where spontaneous rallies to mark the third anniversary of Stalin's death and to protest Khrushchev's denunciation of Stalin quickly evolved into an uncontrollable mass demonstration and rioting which paralyzed the city. Soon, political demands such as the change of the central government in Moscow and calls for the independence of Georgia from the Soviet Union appeared. Protest march, Picketing, Street protesters, Riot, Flag waving. The local Georgian authorities, confused and demoralized, passed on the responsibility to the Soviet military. Later on 9 March the troops deployed in the city opened fire upon the students picketing the government buildings in what the official Soviet version held was "an act of self-defense". The agitated crowds continued resistance on 10 March but were eventually dispersed by tanks. Estimates of the number of casualties range from several dozens to several hundred. In spite of prompt pacification, the 1956 events marked a turning point after which Georgian loyalty to the Soviet Union was gravely compromised and the nation's consolidation intensified. In the view of the historian Ronald Grigor Suny, "the swift and brutal response from the Soviet government illustrated starkly its inability to resolve the dilemma of how much of the Soviet system to change and how much of Stalin's authoritarianism to preserve. The government’s confusion in Tbilisi was a bloody sign that reform was to be limited by the party's determination to preserve its essential monopoly of power." Patriotic sentiment mixed with political protest was further inflamed by the sarcastic and bitter manner in which Khrushchev ascribed all horrors of the era to the "genial" leader Stalin, whom, as he ironically put it, the Georgians so much enjoyed calling "the great son of the Georgian nation". Eduard Shevardnadze, then a Komsomol leader in Kutaisi and eventually to become President of post-Soviet Georgia, later recalled that Khrushchev's ironic remark on Georgians at the end of his speech was particularly hurtful to the pride of Georgian youth. 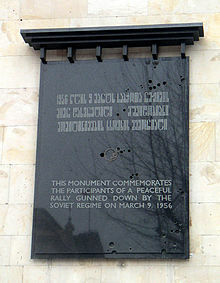 According to the special report of Vladimir Janjgava, Georgian SSR Minister of Internal Affairs, the unrest began on 4 March 1956, when groups of students gathered to mark the third anniversary of Stalin's death at the Stalin monument at the Kura embankment in downtown Tbilisi. Indignant at Khrushchev's speech, they were aggressive towards the policemen who had thrown a cordon around the area. Georgian communist Parastishvili climbed the Stalin monument, drank some wine from a bottle, smashed the bottle and said: "Let Stalin's enemies die, like this bottle!". Protesters worked out their demands to authorities: an official holiday day on 18 December (Stalin's birthday), publishing of articles devoted to Stalin's life in all local newspapers, showing of films The Fall of Berlin and The Unforgettable Year 1919 by Mikheil Chiaureli (both films were typical cinematic pieces of Stalin's cult of personality) in cinemas and invitation of the Chinese marshal Zhu De, who was at that time visiting Georgia, to the meeting. By the end of day, the number of demonstrators reached 70,000. The central Soviet Ministry of Internal Affairs initially underestimated the scale of the protests, and the information based on the minister Janjghava reached the Central Committee later on 8 March. By that time, the city had become paralyzed. The meetings were simultaneously held in several places, especially in Lenin Square and at the wreath-covered Stalin monument. The central streets were full of the demonstrators who loudly denounced Khrushchev, demanded that Stalin be rehabilitated and that his anniversary be allowed, and specifically asked Vyacheslav Molotov to defend Stalin's name. Barricades were raised, buses and cars overturned. The crowd directed traffic and in several cases even stopped it. Several clashes broke out with the drivers who resisted and with the police. When several activists were arrested, the demonstrations grew even more massive and the crowd became more aggressive. The Georgian first secretary, Vasil Mzhavanadze, addressed the protesters and the visiting Chinese marshal Zhu De greeted the crowd, but he refused to visit the Stalin monument and the demonstrations did not disperse. The events that followed are less clear. Later that day, the decision to bring troops of the Transcaucasian Military District, then commanded by Col. Gen. Ivan Fedyuninsky, into the matter was made in Moscow. The predominantly Georgian units stationed in the area were not deployed because of suspected unreliability, however. The Soviet Interior Ministry officials reported that Tbilisi had gone out of control. They[who?] claimed that the demonstrators, many of whom were allegedly drunk and armed, were pillaging the city, contemplated the pogroms of ethnic Russians and Armenians, and planned to seize the government buildings. The same evening, the authorities broadcast though radio an appeal calling the rallies to cease and announced that the commander of Tbilisi garrison, Major General Gladkov, was introducing a curfew beginning at midnight on 10 March. Many protesters sensed an approaching threat and began to leave the city center. Close to midnight, however, people learned that the delegation sent into the Communications Building had been detained, ostensibly for verification of identity. The crowd rushed to rescue the delegates and a clash with the soldiers guarding the building ensued. The troops started firing into the crowd to prevent the protesters from storming the building. Simultaneously, tanks moved to oust the demonstrators from Lenin Square and at the Stalin monument. The protesters tried to resume rallies on 10 March, but they were again dispersed by the troops. Several dozens, if not hundreds, died in this crackdown. As no official report exists, various estimates put the number of casualties from 106 to 800. Hundreds were wounded and injured. Over 200 were arrested in the ensuing reprisals and many were subsequently deported to labor camps in Siberia. Although no apparent attempts at defying the Soviet rule in Georgia were to be made until April 1978, the grudges against the central government in Moscow continued to be held. Many in Georgia held Khrushchev personally responsible for ordering the army to fire on the protesters. The Tbilisi events made Georgia's deviance from the rest of the Soviet Union, with the possible exception of the Baltics, apparent. The loyalty to the Union was gravely compromised and an anti-Soviet sentiment became an essential feature of the reemerging Georgian nationalism. ^ Lurye, Lev (2007), 1956 god. Seredina veka, p. 134. ISBN 5-7654-4961-1. ^ a b c Lang, David Marshall (1962), A Modern History of Georgia, pp. 264–265. London: Weidenfeld and Nicolson. RusArchives.ru: 1956 photo of the Stalin monument (now removed) in Tbilisi. Revolutionarydemocracy.org: Soviet journalist about the incidents in Georgia, March 1956. Soviethistory.org: L. Piradov’s Criticism of Student Behavior, 1956.